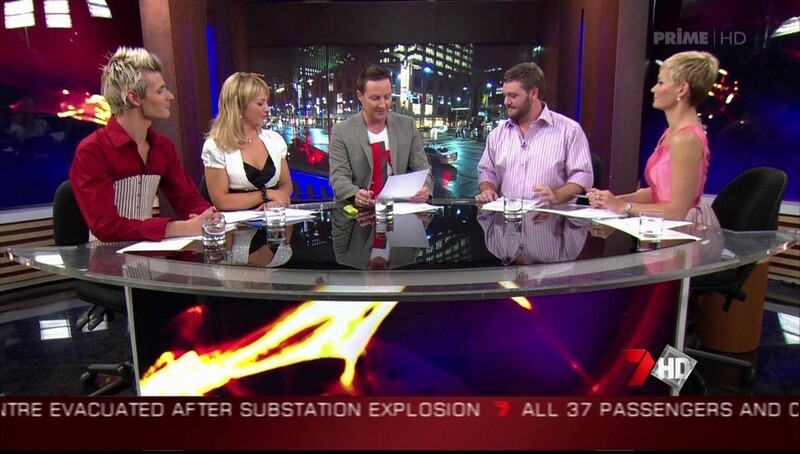 Caught a bit of The Night Cap which premiered last night at 10:30pm on 7HD. I actually watched it online, although it didn’t start till a good 15 mins in (so no full review here). 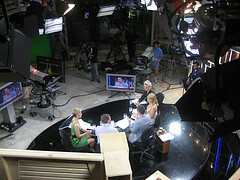 The show was essentially a late night version of Sunrise, with five presenters including Matthew White holding the fort. There were a couple of correspondent crosses and much Panel style debate. As with radio it incorporated talkback calls and emails from viewers too. Curiously, during the commercial breaks the online version cut to a wide studio shot that allowed internet viewers to watch behind-the-scenes, minus sound. Hi to all the make up and production crew that wandered on set during the breaks (and yes I spied the waving from the cast too!). The show returns next Thursday again at 10:30pm. Hopefully with fewer gags on Corey and no corsets. So boring… It was like a late night Sunrise vs The Panel. The web page for “The NightCap” suggests that you may (also) like “Sunrise” and “The Morning Show”. I doubt this is the mood people feel like watching at that hour, who wants to watch Sunrise at 11pm? I felt Jessica Rowe was far too prudish for this hour! I knew the show was coming, but I’ve seen no advertising saying the show was currently airing, so I think they know it’s not yet ready for public viewing!? So far Seven’s home made shows for 2008 have been very poor in my opinion first “Out of the Question” and now “The NightCap”, I’m not going to hold my breath for anything new by Seven. My god, Nightcap.. the worst show to hit any screen in a longtime.. Derogatory, unfunny, lacking any wit or talent.. They don’t have the right to have a show. About as quirky and funny as a funeral. Get rid of Zach, he did nothing. I saw Michael Pell on the promos, is he the other token gay. Hope he contibutes more than Zack. Also I felt Matt was a bit rude to the 2 callers, they were not thanked for the call.. just glossed over. It was better than I thought and better than the recent Panel Xmas shows. I’ll keep watching. just for Monique and Paul Murray. And what’s the Zach’s role there? It looks to me he’s just another token gay character on the show, which would normally appear with some gag or a gossip. Hopefully in upcoming episodes he’ll be more engaged in what’s happening at the table. He was hardly noticed until he was asked to give advise about romantic proposal to a viewer (was it scripted?) and about his corset business. Very lame. yeah – since when is anything decent on at 10:30? I loved the NightCap – finally an Australian show that is worth staying up for! So far it seems like perfectly innocuous late-night viewing; basically “Sunrise for drunk people” I guess. Okay, so it’s The Panel II. Triple M Guy is the new Mick Molloy. Zach, meanwhile, is almost superfluous and needs to do more than be Token Clichéd Gay Guy. He needs to join in with general conversations more and not wait to be called on to “do Zach”. And I’m 99% sure those “calls from viewers” were fake. ESPECIALLY “Amanda From Melbourne” “spontaneously” calling in about Corey the party teenager – when they’d already pre-promo’d that discussion of it 10 minutes earlier! She DID seem to say all the right things to guide the discussion, now, didn’t she? Oh, and the late start was of course due to the usual, completely scheduled over-run of It Takes Two. Watched this as well some harmless fun, wouldn’t watch it if something was decent on or maybe flick in during the ads.